Let me begin this review by noting that the VPI Avenger Reference is part of a steadily growing number of “extreme turntables.” It sells for $17,000 without an arm, $20,000 with the JMW 12-3D Reference arm, and $20,800 with the new VPI “Fat Boy” tonearm. It also sets a standard of sound quality that almost demands that it be equipped with cartridges that cost well over $1000, and, at that, it still isn’t the most “extreme” turntable in the VPI line. 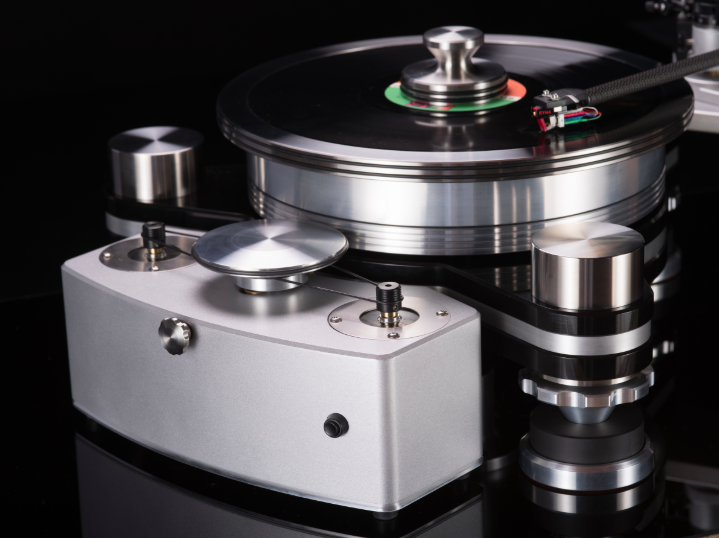 The ne plus ultra model is the VPI Titan, which adds another layer of mass and vibration-control and costs $40,000. Like almost all true state-of-the-art products in the high end, the Avenger Reference exists for the handful of audiophiles who can afford to test the limits of what an analog front end can do. And like all competing state-of-the-art equipment, it pushes those limits to a point of diminishing returns. VPI makes some great and highly affordable turntables like the Prime Scout, which costs $2200 complete with a really good VPI tonearm. The Avenger clearly outperforms the Prime Scout, but you pay a lot to get these improvements. Since its whole purpose is to do as little to the sound as possible, it is a bit hard to review the Avenger Reference. It is one thing to talk about subtle colorations; it is another to talk about a subtle lack of them. The VPI Avenger chassis is made out of three layers of bonded acrylic/aluminum/acrylic, with damping material between layers. It is locked in by using three steel corner isolation posts and bolts, and has a massive bearing assembly. The corner posts can hold up to three tonearms, and have adjustable machined knobs giving the user the ability to easily raise and lower the height to level the table. The adjustable armboards are made from 6061 aluminum for rigidity and grounding. The original rim drive was heavy, hard to move, and hard to adjust. The Avenger, by contrast, uses a rim drive with a sliding machined “V” slide, like that of a lathe. It provides the speed stability of the best direct drives, all the power that is needed, and can be repaired anywhere in the world. A new power supply called the ADS is standard on all rim-drive ’tables. It keeps the Avenger’s motors fully engaged with the rim drive and easily powers the unit through heavily modulated grooves. The platter uses magnetic drive to isolate the platter and record from any rim-drive and motor-drive noise, and to smooth out platter rotation. The slave platter weighs 20 pounds and is driven through magnets by the drive platter, which weighs 10 pounds and is driven by the rim drive. There are six high power magnets near the record label that drive the slave platter from the rotation of the driven platter. This not only isolates but also smooths out the motion of the slave platter, as the magnetic flux between the platters acts as a damper for more fluid motion with less micro-vibrations. The slave platter runs on a 6" long shaft spinning at the driven platter speed, so there is virtually no noise generated by the platter spinning on its inverted bearing shaft. The Avenger’s tripod base and frame design allows for multiple arm use with no muss or fuss. VPI feels that this capability is required by many audiophiles in an era of super-high-quality mono cartridges, different stereo designs, and different tonearms. The tripod design also allows different feet to be used at different levels of design, from simple isolation to air-suspension floating designs. It allows the changing of feet as new ideas and designs become available, and makes for a smaller footprint for easier installation. The 12" tonearm VPI provides for the Avenger is VPI’s newest 3D-printed design, the JMW 3D Reference. It has a structure that is so well damped it has less than 1.5dB of resonance in the critical 9–12Hz range. The 3D-printed armtube takes its name from the additive manufacturing (or “3D printing”) process used to produce it. This lets 3D manufacturing create a single-piece structure from headshell to rear stub designed and made to provide a totally even mechanical resonance response. The arm is produced in shapes that can’t be machined, and wall thickness, shape, and structure can be varied so the resonant character of the arm can be optimized for a device that has to be rigid and yet not resonate. Production is uniform and repeatable in a long string of pieces. The VPI arm is 12" long for very low tracking error, very low distortion, and the best tracking of inner grooves. The tonearm base is adjustable to provide VTA/SRA on the fly and allows micro-adjustments of all VPI tonearms installed on the Avenger.